If your home isn’t selling you should ask yourself how important is it in advertising homes for sale? Not just that but also what type of advertising should I be doing to sell my home? These two questions should be asked before even putting your home up for sale. Likewise a budget should be established to meet these objectives properly. There are many types of advertising and hiring a Realtor will accomplish most of the important ones for you. Marketing your home such as a for sale sign in front of your home, different print ads such as industry magazines and online to name a few will likely be done by the Realtor you hire. Due to technology and the internet, statistics show that 86% of buyers look first on the internet to shop homes and Realtors. You’re likely doing the same if you’re reading this now so make sure you hire a real estate agent that knows the importance of online marketing and how to do it. Advertising Homes for Sale Online & Offline is your best bet! When you’re ready to select an agent, don’t hire your friend or a family member, unless of course they are active real estate agents engaged in the business full-time. One of the biggest mistakes people make is hiring someone they know just to give them some business. Think about this before you hire Uncle Mike to sell your home, if you were going to court and you needed an attorney would you just hire a family member that did some law on the side? Why not??? The same rules apply in a real estate transaction and in fact not hiring a professional can land you in court if something goes wrong in the transaction. Hire a professional! TIP: Never let an agent buy your listing, this means they come in telling you they can get you the most for your home and will list it at a higher price now only to hit you up later for drastic price reductions. In the end you’ll be stuck with longer days on market. Look at the price ranges of the agents and if one is grossly outside that margin then kick them to the curb! So the time arrives and you’re ready to begin your advertising homes for sale, hopefully by now your agent has a sign in the yard, has contacted their buyer pool and emailed the other local agents in the area about your home. If so then you’re probably already getting showings if your home is priced properly, if a week goes by and no showings then review your pricing with your agent. That discussion is for another article titled Sell Your Home Quickly. On your second week of being on the market you should start to see the momentum as this is about the time online marketing ramps up. If the agent has done their online marketing campaign properly then they’ve put your home in social media outlets, email marketing blasts, posted on major websites like Zillow, Trulia and Realtor.com as well as partnered up with listing syndication services to spider your home on millions of other websites. Since 86% of buyers are looking online first don’t you think that’s the best place to put the most effort? We do and our agents are very tech savvy so we do get great online results, fast! 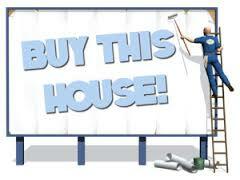 For more information on advertising homes for sale or if you’re looking to sell your home, please contact us. We’d appreciate the opportunity to assist you in accomplishing your real estate goals!